It is true that that the yellowpages, newspaper and the “saver” publications are effectively obsolete or at the very least, antiquated. A well designed brochure is an excellent new client “leave behind” it, along with oversize color postcards are the excellent options for direct mail, a marketing tactic that has also remained very popular in this digital age. 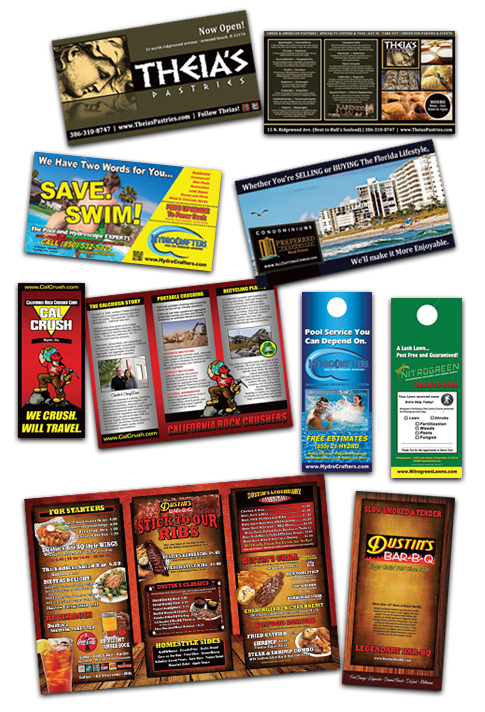 We Custom Design, Copywrite and Print Brochures, Flyers, Business Cards, Postcards, Door Hangers, Menus, Letterhead and more. Because we are intimately familiar with so many industries, our designs are always attractive, compelling, and hard hitting where required. Print Ads and Billboard Ad Designs – Many magazine, newspaper and billboard companies offer Free design services but like anything else, you get what you pay for. We design Ads that work in any medium and we can often offer an insight to effectiveness that many of the “in-house” providers cannot.